Some 27 years ago, on Valentine's Day in 1991, The Silence of the Lambs was unleashed in theatres. Romantic, eh? In any case, the film wasn't expected to have the impact that it did, being released in February. However, Jonathan Demme's adaptation of Thomas Harris' popular novel was such a slam dunk that The Silence of the Lambs swept the Oscars the following year, winning Best Actor, Best Actress, Best Picture, Best Director, and Best Screenplay. This is also known as one of the highest-rated films of all time. If you're reading this, you know that Jodie Foster plays Clarice Starling, an FBI trainee who is tasked with trying to get an infamous doctor and cannibal serial killer (Anthony Hopkins) to help the FBI capture a new killer who preys on women, Buffalo Bill/Jame Gumb (Ted Levine). There are so many reasons why The Silence of the Lambs was a gamechanger in cinema --- its feminist lead and themes wherein Foster is not sexualized in the slightest, but retains her agency, even when she is outnumbered by men in many scenes. She's the savior, not a simple plot device which moves along the desires of the usual, traditional male protagonist. Of course, the film is also problematic in its depiction of Buffalo Bill and his cross-dressing; I have no doubt that if the film was in production today, that character would surely be portrayed in a less offensive manner. The film sounds wonderful; dialogue and sounds are all crystal clear. As for picture, this transfer is a new 4K restoration supervised by cinematographer Tak Fujimoto. And while the film remains a bit grainy, some visual details really pop, due to the textures added in production. All of those repeated close up shots between Hannibal and Clarice are still unnerving, in case you were wondering. 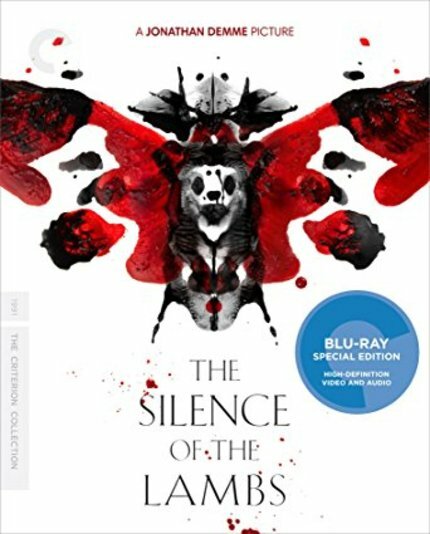 This two-disc Blu-ray edition from Criterion overflows with featurettes, including nearly 40 minutes of deleted scenes, hours of interviews, and a deluxe booklet with an essay by critic Amy Taubin, an interview with Jonathan Demme, and a great piece from Thomas Harris on the origins of his iconic character, Dr. Hannibal Lecter. My favorite bonus feature is a new interview with critic Maitland McDonagh that goes into considerable depth on real serial killers in addition to the ones made famous by Thomas Harris' characters. This release comes with my highest recommendation, especially for fans of Harris' canon. Read more about Criterion's awesome Blu-ray release of The Silence of the Lambs here.